Happy Thursday! There is only one more day left until the weekend, and by now, many of you may be well into your new years resolutions. Stay strong - whatever your resolution(s) are - stick with them! For my husband and I, we are trying to continue to have balance in our diet, while still enjoying ourselves! Easier said than done! Sure, we consider ourselves "foodies" and love to try all sorts of new foods and treats, but just like anyone else, we have to be careful. Otherwise we would just be eating chocolate cake and eclairs every day... that would not be pretty. Therefore, in the spirit of the new year, I am bringing you a very delicious and hearty meal that is HEALTHY! Yay! 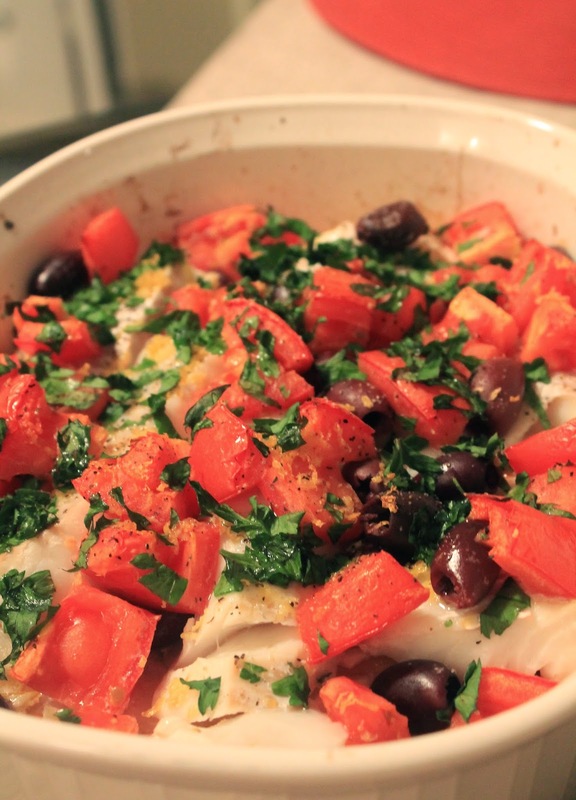 This Mediterranean Fish Casserole may look like a hot mess, but it is a delicious hot mess! 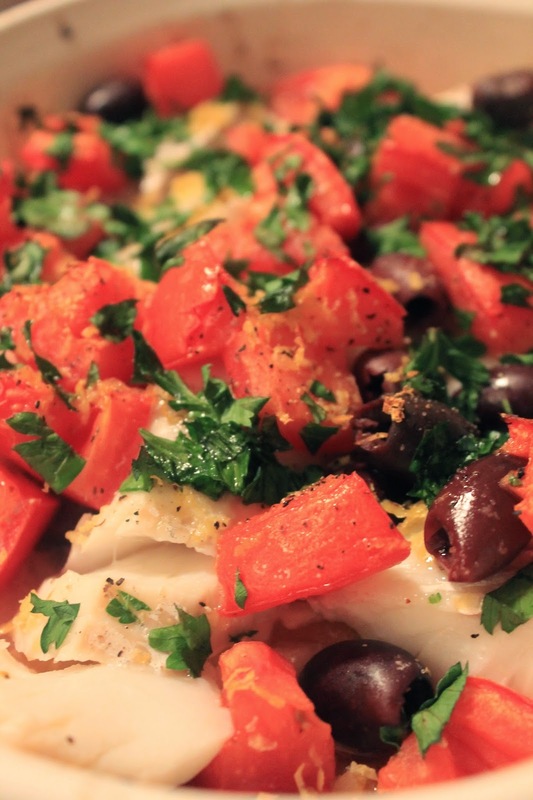 Plus, the Mediterranean diet is always praised as being a great one to be on! 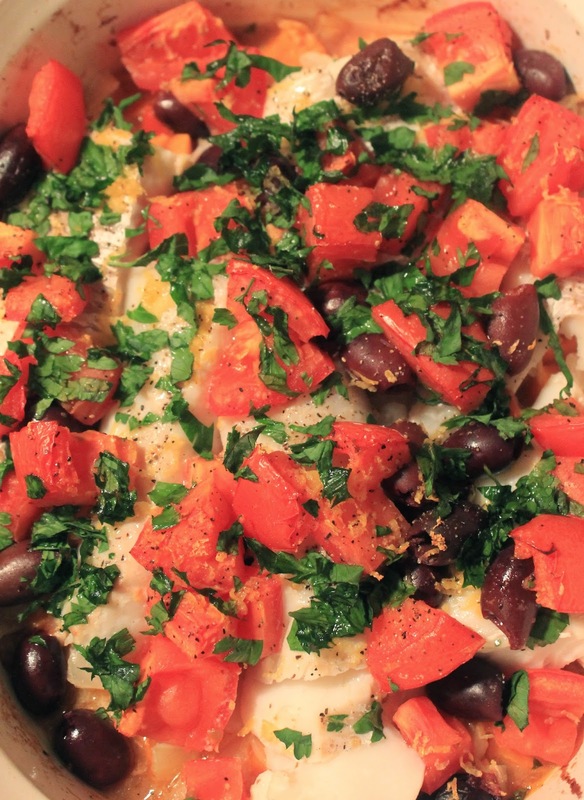 Lots of fish, healthy fats like oils, veggies, and pasta! Oh wait, maybe not so much pasta, but you get the gist! Haven't you ever wondered why people in Italy, Greece, and Spain always look so happy and healthy? 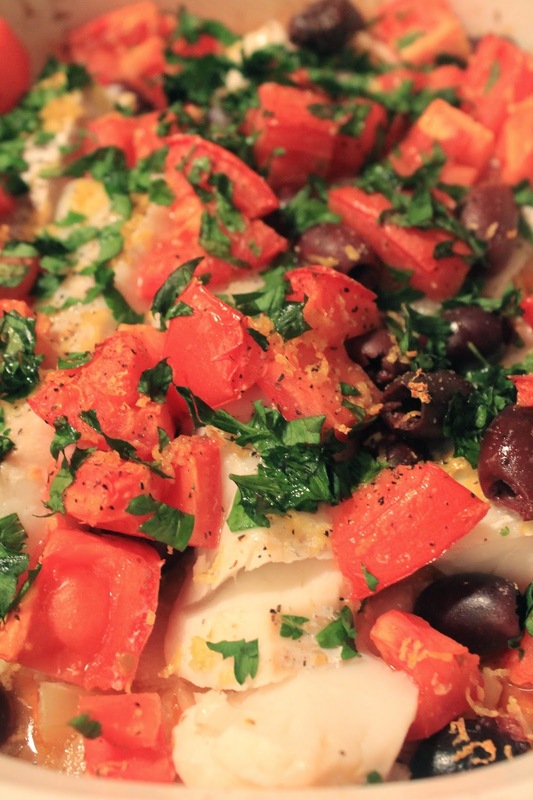 Well dishes like this casserole are why! 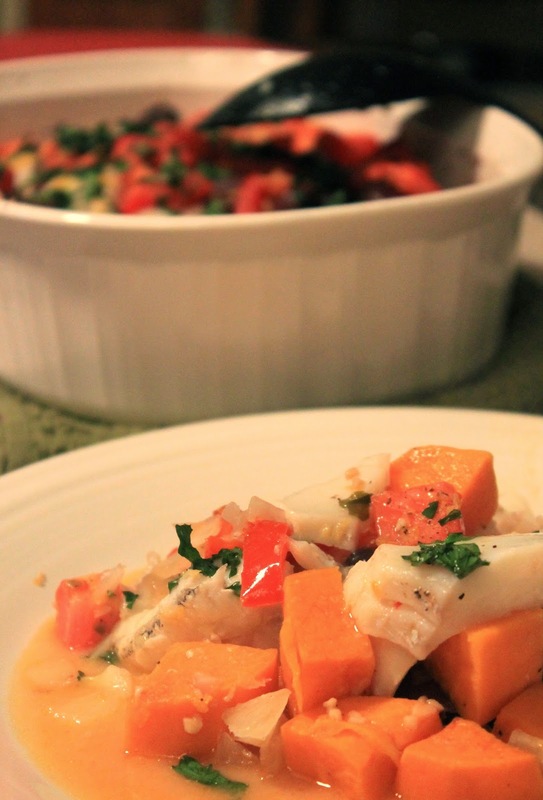 In a medium casserole dish, toss the sweet potatoes and Italian peppers with the olive oil and salt and pepper. Roast in the oven for roughly 25 minutes, or until they become fork tender and start to brown. Check about halfway through to give them a little toss. Once the veggies are done, remove the casserole dish from the oven. Toss the garlic and onion on top. 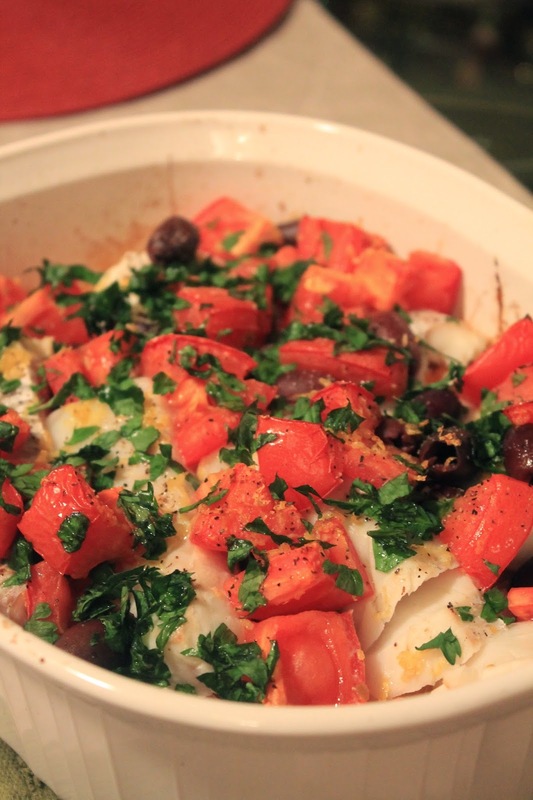 Then, layer the remaining ingredients in the order that they are listed above: fish, olives, tomatoes, lemon zest and juice, and parsley. Return the casserole dish to the oven and bake for another 25 minutes, or until the fish flakes easily when tested with a fork. Let rest for a few minutes and then dig in and enjoy! I love Mediterranean food! This looks so good!